Rev. Paul M. Larson has served as President of the Church of the Lutheran Brethren since 2014. As such, he serves as leader and pastor of the CLB in defining its vision and advancing its mission. He leads the CLB Mission Team and coordinates mission with leaders of CLB North American Mission, International Mission, Communication and Prayer, Finance; and coordinates mission with the President of Lutheran Brethren Seminary. He serves on the denomination’s guiding Council of Directors, and chairs the CLB’s Theological Council. President Larson was born in Clearbrook, Minnesota and raised in his faith at Elim LBC. After high school, he attended the CLB Bible College in Fergus Falls, Minnesota. He graduated with a BA in History from Rocky Mountain College in Billings, Montana, where he served as youth director for Yellowstone LBC. 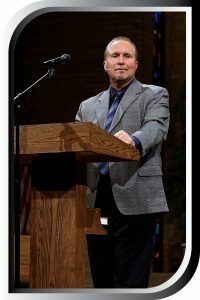 In 1988 he graduated from Lutheran Brethren Seminary with a Master of Divinity degree, and was ordained into ministry in 1989. President Larson was a church-planting pastor at Word of Life LBC in Fort Collins, Colorado. He has also served as senior pastor for congregations in Fullerton, California and Eau Claire, Wisconsin. He and his wife Bee live in Fergus Falls. They have five grown children.